As Christmas approaches a lot of people consider giving telescopes to their favorite budding astronomer. Right now all kinds of stores are full of scopes for the run up to Christmas. Then they'll be gone for another year. Please before you go out and buy one of these, read on. I'll point you to some tips and alternatives. Also, I take a look at some of the scopes I've seen around town. While I know lots of astronomers who grew up with these low end scopes and stuck it out, I know a lot more people that gave up out of frustration. I highly recommend reading Alan Dyer's Ten Tips for Buying a Telescope and Giving a Telescope as a Gift over at Visual Astronomy. Or get Terence Dickinson's Night Watch and read the chapter "Stargazing Equipment" and especially the part called "Trash-Scope Blues". Another key to enjoying a telescope is to set the right expectation. Lots of of telescope packages are adorned with large colourful photos of galaxies and nebula. Don't expect to see quite the same thing yourself. These photos were all taken over a long period of time with really large aperture telescopes meaning they collect far more light than your eye can in real time. A telescope like the Hubble brings in about as much light as 100,000 beginner scopes! But there are still lots of things that show up beautifully. If you've read the articles above, some of these tips will be familiar. Others will not. High power is a trick so don't be fooled. The promise of high power is deceptive for many reasons. Anything that gives more than about 150x is likely to be unusable. Magnification is a function of how the eyepiece works with the scope. Aperture trumps magnification. The diameter of the main lens or mirror is more important than its length. Simply put wide eyes means more light. Think of owls not mice. Also higher magnification powers needs larger apertures or they just dim out. Premium Eyepieces usually aren't. Quality eyepieces are expensive. Counterintuitively, low power eyepieces are more expensive than high power eyepieces of equal quality. Packages with more than two or three eyepieces should be suspect. Barlow lenses which double or triple magnification are almost always not useful on a beginner scope. Finally, just because the box says "Premium Eye Pieces" doesn't mean it's true. Solid mounts and controls are paramount. If the scope shakes, won't hold position, or can't focus, it will be frustrating, disappointing and unusable. Yoke mounts are usually headaches. Poor finder scopes are often problems on beginner scopes. Again, magnifying finders are just small scopes so more aperture is better. Think sausages, not pencils. Red dot finders are increasingly common and often better than entry level magnifying finders. Portability versus size. Where will you use it? How portable do you need it? If you have a bit more money, don't go aperture crazy. You still have to get the scope and tripod to your observing site. An over sized scope will not get used. Check out specialty telescope shops. Telescopes are not a one size fits all product. If you buy from a store that only stocks scopes around Christmas you aren't going to get much help and support. 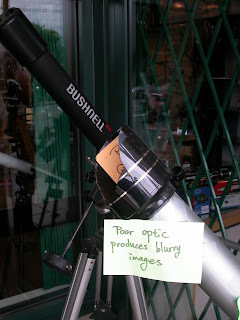 Frankly the people who work in telescope specialty shops use the equipment and can help you find what you need. They may even have one setup that you can try. Staff in the malls or box stores won't be able to answer any questions. I've seen the scopes setup in these other stores for display, you can't try them. Also, telescope stores sell used which can be a good way to get more for less. Return and trade-in policy. Check out the stores return policy before you buy. eBay, Kijiji, and Craig's list are full of scopes for sale after Christmas many of which are nonreturnable junk. Also, many telescope shops will take trade ins when you're ready to move up. Saturn! One of the main reasons for getting a beginner telescope over binoculars is Saturn. Or rather it's rings. Unfortunately, for the next few months Saturn is not cooperating as the rings are nearly edge on as happens about every fifteen years. This will fix itself but you'll need to wait. Remember that every telescope is going to be a compromise between budget, aperture, portability, and features. Trade-offs are inevitable. Better to have a good starter scope that works well than one that tries to do everything and fails. There are only a few stores in Toronto where I would even consider buying astronomy equipment. Last year there were three. Khan Scope and Efston both still serve this market and have good equipment. 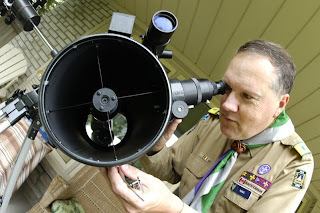 Unfortunately Kendricks has left the retail telescope market but still makes fine equipment. My personal preference is Khan Scope. However, I did spot some scopes in other stores and thought I would comment on them. There is a well known chain that sells educational toys and books. It's a great store, but not for telescopes. They had two scopes at around the $100 price point with the less expensive named brand model being the better of the two. Personally I wouldn't touch either. 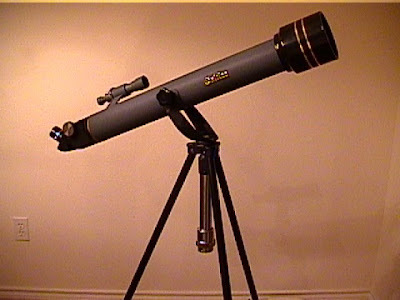 A Canadian made refractor scope. This is perhaps the single worst telescope I have personally ever seen. It's specs include:60 mm aperture, 700 mm focal length, 3 eyepieces (K 20, H 12.5, K 9), 3x Barlow, rotating "turret" eyepiece holder, yoke mount tripod, 5 x 20 finder. The aperture is too small, eyepieces very basic giving 35x, 56x, 77x, Barlow lens is almost useless giving 105x, 168x and 233x, the plastic turret looks like it came from a microscope and is gimmicky, the finder is under apetured for its power, the mount very flimsy looking. Inside the dew hood there was an inner hood around the main lens that looked like it may have reduced the aperture further. I've seen plenty of these scopes advertised on on e-Bay and Craig's list and sometimes at far above ths price. A named brand's entry refractor. It's specs include: 70 mm aperture, 700mm focal length, two eyepieces (MA 25 and 9 with standard barrels), yoke mount tripod , red dot finder, PC planetarium software. The aperture is the bare minimum, the eyepieces are basic and give 28x and 77x, but it has a yoke mount. The big box store had a scope that on the surface looked more promising at just below the $200 price point. A named brand's GOTO refractor. It's specs include: 90 mm aperture, 800 mm focal length, 5 eyepieces (MA 25, 20, 17, 12, 6), computer guided GOTO mount, red dot finder. The aperture is better, but the claim of "Premium eyepieces" was probably inspired by Bertrand Russell. Five eyepieces in a low price package practically screams poor quality. Also, there is no way to test the automatic mount mechanics before you buy. I did notice this same entry GOTO at a couple of the local telescope specialty stores last year but not this year. I've also seen a couple in for repair - not a good sign. Overall it seems like a lot for the money and I'd be wary that it's too good to be true. Ray Khan took the time to show me three interesting beginner offerings all within the budget price points I mentioned. Meade 7x50mm Travelview binoculars. These are a good size, with a nice field of view, are small enough for children, and can be mounted on a camera tripod. They have excellent light gathering being nearly right on the rule of thumb of 7mm for every 1x magnification. A 70mm refractor from Celestron with a 900mm focal length. It has a solid mount and smooth mechanics and uses a red dot finder. It also shows correct images which is a plus for beginners. Two eyepieces at 20 and 10 mm. I believe the eyepieces are called "Super"an improved version of the MA lenses. Coated optics to improve your view. And PC planetarium software. An 80mm computerized GOTO refractor from Meade with a 400mm focal length. It comes with 26 and 9.7 mm Plössl eyepieces and built in switchable 2x Barlow. It includes PC planetarium software. A "backpack edition" is available. And I had one of those trashscopes when I was a boy. Both it and its finder scope were frustrating, over powered, under apertured. The wobbly yoke mount finally broke. It put me off for years. I do have one other very special telescope which you can read about in Mang interviewed in Etobicoke Guardian and Mang gets a space telescope! A few words on telescope types. Telescopes come in several types. Basically there are refractors which use lenses to focus the light, and reflectors which use a large mirror to focus the light. For practical reasons, smaller aperture scopes are typically refractors while large ones are reflectors. There are also a number of other types which use compound optics and mirrors. Most of these have hyphenated names. A more detailed description can be found at Visual Astronomy, here. Another thing is that most astronomical telescopes don't show correct images. The image is reversed and this can take a bit of getting used to for a beginner trying to move the scope. This is also a true of most magnifying finder scopes (Red dot finders don't suffer from this). A few words about eyepieces. A lot like camera lenses make the camera, eyepieces are the business end of your telescope. If you are looking to decode the alphabet soup shorthand above (e.g. K20) it describes the design and size of these basic eyepieces. The letters refer to the design: H for Huygens (a 17th century design), K is for Kellner (a 19th century design and the first modern achromatic eyepiece with a common focus for all colours). MA are an improved Kellner design as are "Supers". The number is size in mm with the larger number being lower power. Other higher quality types are named after their designers like Plössl and Nagler or by their companies like Ethos. Most telescope use standardized interchangeable eyepieces with 1.25" barrels (some use 2"). This means you can easily get different and better eyepieces and keep them for your next scope. Avoid anything else. To calculate your magnification divide the focal length of the scope by the eyepiece size (e.g. 700mm / 12 mm = 58x power). For comparison purposes, see the photos of 4 eyepieces. I've contrasted two sizes of basic eyepieces with a higher quality version. I included weight because it indirectly gives an idea of quality. Below are side views showing (left to right) Plössl, Super, Ultra Wide, and Huygens. 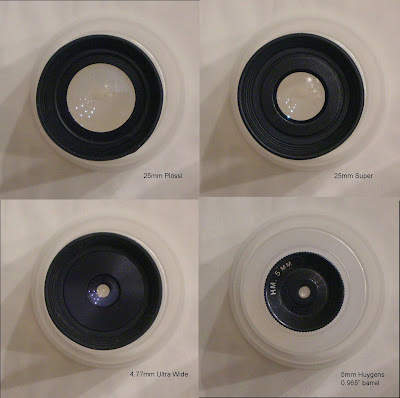 Below are top views of the same 4 eyepieces. High quality Barlow lenses also exist. They are often more useful on short focal length scopes as they effectively double (or triple) the focal length. For more information on eyepieces see Wikipedia, here. A few words on mounts. Again their are a few basic types that fall into two categories. Those that can track the stars without rotating the field which are necessary for astro-photography. And those that can't which are typically called Altitude-Azimuth or AZ mounts. Equatorial or EQ mounts are the traditional design for tracking. AZ mounts can still track with computers but will need a wedge adapter for astro-photography. There may be a desire for a beginner to eventually get into astro-photography. This is one of those trade offs I mentioned and probably should be your next scope. I've already dismissed yoke mounts which are cheap AZ mounts. See Wikipedia on telescope mounts, here. Posted by Mang (433rd) at 11:25 p.m. Thank you for this wonderful information ... wish I had had it a couple of years ago. We had a stunning beach house at Kasouga, near Port Alfred on the eastern coast of SA. We had the most fantastic view of the sea and wanted to buy a scope to watch the dolphins and whales pass by, but were just not sure what to get... this info would have helped a great deal! December 6, 2008 at 1:12 a.m.
December 6, 2008 at 8:42 a.m.
You raise a good point. This is about astronomical scopes. For looking at things on earth you want a spotting scope that produces correct images. Aperture can be less important for these. There are scopes that will work as both! Binoculars would be the other good choice. December 6, 2008 at 11:16 a.m.